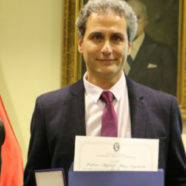 On Wednesday, August 22, in a solemn ceremony, the Academia Chilena de Ciencias celebrated the admission of Alejandro Maass –director of the Center for Mathematical Modeling (CMM) and academic of the Department of Mathematical Engineering (DIM) at Universidad de Chile– as a Corresponding Member . Servet Martínez, National Award of Exact Sciences and Member of Number of Academia, welcomed the new member. Then, Alejandro Maass started his inaugural speech entitled An ergodic journey towards genomics. During the conference he reviewed some essential concepts to understand his mathematical work and reviewed some milestones of his research. “One seeks to understand why different patterns exist in nature,” he explained. The CMM director is the author of relevant publications that have contributed to the study of symbolic dynamics and ergodic theory. Some of its most recognized achievements have to do with local theory of entropy, chaotic systems and low complexity systems, theorems in system structures and symbolic dynamics of cellular automata. He has combined the understanding of dynamic systems with probabilities and discrete structures. His most cited publication showed that a positive entropy implies a a chaotic system. In the 90s, he had his first contacts with genomics. He understood the relationship between the study of the set of genes with mathematics and ergodic theory. In his speech, Maass recalled the creation of the Mathomics laboratory at the beginning of the new millennium and the bacterial copper bioleaching project that he developed for 12 years with Biosigma, a subsidiary of Codelco: “It was the project that made us learn the practical bases of genomics”. He also took the time to thank his professors, collaborators, and the doctoral students to whom he has directed theses. He had thankfully words for the University of Chile, the DIM, the CMM and its officials: “We have a center that is a nice place to work”. He valued the contribution of Conicyt -through funds such as Fondecyt and PIA- and the Millennium Science Initiative, to science and to the work that he, in particular, has been able to carry out. “I do not know what would happen to me and, dare I say, Chilean Mathematics without French cooperation,” he said by referring to the support of the French government. And he ended with heartfelt words of thanks for his family, while projected the last photograph.